There are many ways to make this sandwich, including deep-frying it, but here we’ve presented a basic method for pan-frying that’s much simpler. Don’t forget the red currant jelly—it’s not optional! 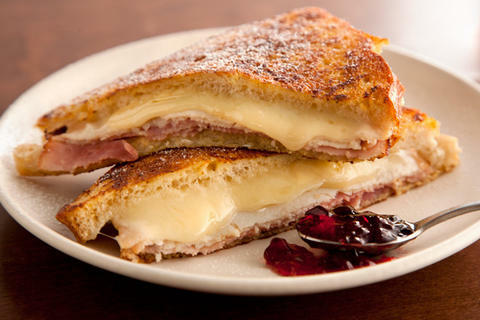 Its sweet tang cuts through the salty, gooey richness of the French toast and filling. Place the egg and milk in a wide, shallow plate and season with salt and pepper. Whisk until the egg is broken up and evenly incorporated; set aside. Place 2 slices of the bread on a work surface and spread 1 teaspoon of mustard on each. Divide the ham and turkey between the mustard-coated bread slices. Place half of the cheese on top of each pile of meat. Close the sandwiches with the remaining 2 slices of bread. Press gently on the tops of the sandwiches to compact slightly.